Samsung has a near-monopoly over mobile OLED panels in the market, and it is demonstrated well by the fact that Samsung is the sole supplier of OLED displays even for its arch rival’s iPhone X. The situation in the TV market is, however, different. Samsung has stopped making OLED TVs and started selling QLED TVs, while also investing in a more futuristic MicroLED technology. On the other hand, LG’s long-term bets on OLED technology for TVs started yielding results with the company turning into a dominant force in the premium TV market, putting its critically acclaimed OLED TVs in direct competition with Samsung’s QLED TVs. Samsung seems to be feeling the heat from LG’s success with OLED TVs and is now reportedly resorting to marketing the downsides of OLED TVs to sell its QLED offerings. A report in Business Korea says that LG Electronics in Thailand and Malaysia has recently sent official communication to the Samsung counterparts in these countries to stop the ad campaigns targeting the supposed burn-in problem in LG OLED TVs. LG Electronics is reportedly angry about a certain 10-year burn-in warranty ad by Samsung that lists the advantages of QLED TVs, claiming they are free from burn-in, unlike OLED TVs. The ad also apparently shows some pictures of OLED TVs with burned-in screens, along with citing burn-in test results from Rtings – a website which does extensive burn-in tests. LG is not happy with Samsung claiming that all OLED TVs suffer from burn-in and alleges Samsung is misleading the customers with its advertisement. Samsung has reportedly refused to withdraw the ad by saying that it is not targeting LG TVs specifically but just trying to inform the customers about OLED TV problems in general. The report also states that LG Electronics is even considering legal recourse if Samsung refuses to withdraw the advertisement. This is not the first time Samsung is targeting LG’s OLED TVs for burn-in issues. In August last year, Samsung had published an ad titled ‘QLED vs OLED: The 12-Hour Image Retention Test’ on its YouTube channel. The video compares image retention on a Samsung QLED TV and an LG OLED TV, where the former emerges victorious unscathed by burn-in. Samsung also published a blog post last year explaining the burn-in problem in OLED TVs and marketing its QLED TVs. It’s a bit ironic for Samsung to target the problems of OLED panels as it is the largest supplier of mobile OLED panels in the market. Granted that the lifespan of most smartphones is less than a couple of years and so burn-in, which is related to long periods of usage, is a bigger problem on TVs that are expected to last much longer. Still, it comes across as a sign of Samsung’s insecurity when it focuses too much on the flaws of OLED TVs instead of highlighting the strengths of its QLED technology. The post Samsung targets LG’s OLED TVs for their burn-in problem appeared first on SamMobile. Huawei CEO says the company is still committed to the US market despite "groundless suspicions"
Oppo just announced its R15 flagship duo, which not only represents the latest and greatest from the world's fifth largest manufacturer, but also comes to show what to expect from OnePlus and Vivo - the other two in BBK Electronics' smartphone trifecta. [Poll] Would you buy a non-Samsung phone with a notch? Apple wasn’t the first manufacturer to employ a notch on an otherwise “all-screen” smartphone display. That was Essential, the company created by Android co-founder Andy Rubin, which launched the Essential Phone to much fanfare, both because one of Android’s masterminds was behind it and because of the notch at the top of the display. Apple did, however, make the notch mainstream thanks to the power it holds when it comes to setting the trends, and it also managed to make the notch worthwhile with the Face ID technology. Android OEMs have nothing of the sort, but many Chinese manufacturers, in their ever-present need to do what Apple does, have been releasing phones with a notch in recent months. Google hasn’t been sitting idle, either. The company has added official support for notch-equipped devices in Android P, even though none of the major manufacturers have talked about embracing the notch just yet. But the major players are no longer the only ones who matter. Indeed, other than Samsung, big OEMs like HTC, Sony, and LG have been losing ground to Chinese manufacturers, who continue to put out smartphones with impressive specs for a fraction of the price commanded by devices from mainstream OEMs. Even OnePlus has confirmed that its next flagship will have a notch, so it’s only a matter of time before the market is flooded with iPhone X-like designs that the consumer can’t ignore. That’s where our poll comes in: We want to know if you would be willing to purchase a non-Samsung device if it attracts your attention despite the presence of a notch in the display. We already know most Samsung fans aren’t willing to accept the notch and are perfectly fine with the Infinity display found on its devices, but what if the Korean giant also joins the notch bandwagon somewhere down the line? Will that make it easier for you to buy a phone with a notch from another company? Well, go ahead and tell us by voting in the poll, and also let us know your thoughts in the comments. Would you buy a non-Samsung phone with a notch? The post [Poll] Would you buy a non-Samsung phone with a notch? appeared first on SamMobile. It has happened at least once before, and it seems to be happening again. Samsung has gone ahead and released the security patch for the upcoming month for one of its devices, before Google has released official details of what that patch entails or rolled it out for its Pixel phones. The device in question is the Galaxy J3 (2017), which is receiving an update in the Netherlands and Luxembourg with the April 2018 security patch. We don’t have the J3 (2017) in our possession at the moment so we can’t confirm anything, but the details for the latest firmware for the phone do include a mention of the April patch. Naturally, there’s no telling what or how many vulnerabilities the April patch will fix, though it won’t be long before Google makes the customary announcement on its website. If the new J3 (2017) update indeed packs next month’s security patch, it would mark yet another instance of a budget Samsung phone getting the latest security update before devices in the flagship lineup. If recent history is any guide, the next device to get the April 2018 patch would probably be from the Galaxy A lineup, while Samsung’s flagships might be waiting around till the end of April (or maybe even longer) for the same. We’re working on getting confirmation that the update does indeed come with the April patch, but if you have the Galaxy J3 (2017) and live in the Netherlands or Luxembourg, try downloading the update from the Settings » Software update menu and letting us know the security patch date you see in the About phone section of the phone’s settings. You can also update using the full firmware files from our database. The post Samsung’s already pushing out the April 2018 security patch to one device appeared first on SamMobile. Did you enable the floating camera button on your Galaxy S9? If there’s one thing Samsung’s camera app doesn’t lack, it’s the number of ways one can take a picture. You can use the standard shutter button inside the camera, press the volume buttons, use voice control, or hold out your palm towards the camera to make it click a picture on a timer. The palm gesture is especially handy when you want to take a selfie and can’t reach the shutter button or volume keys without awkwardly twisting your fingers, which can also lead to accidental touches on the display. To get around that problem, Samsung introduced a new feature called the Floating camera button with the Galaxy A (2017) series, and it’s something you should enable on your Galaxy S9 and S9+ if you haven’t already. What’s the floating camera button for? Well, precisely what the name suggests: You get a camera button that can be freely moved around on the screen and placed wherever it’s easiest to access. This is in addition to the standard shutter button, which stays right there at the bottom center of the camera viewfinder. Again, selfies are where the floating camera button is most useful, and it complements the palm gesture extremely well, giving you the ability to take pictures without the inconvenience of reaching for the volume keys or the regular shutter button. Of course, you can also place the floating button next to the default shutter button if you want, so you have a larger area to tap for taking a picture. But, like many useful features found on Samsung devices, the floating camera button is disabled by default, so you need to make a trip into the camera settings to activate it. It’s a simple process, but to make it even simpler, we’ve listed it out step-by-step below. Step 1: Open the Camera app on your Galaxy S9 or S9+, then tap the settings icon (the one designed like a gear). Step 2: Scroll down to the bottom of the settings menu to find the Floating camera button option. Step 3: Enable the floating button by using the toggle next to it, then exit the camera settings. You should now have two shutter buttons in the camera app, and the floating button can be moved around anywhere in the camera interface. The floating camera button will also be available when you’re using the rear camera, so it’s not exclusive to just taking selfies. Well, go ahead and take some pictures using that button, and if you have issues following the steps above, leave a comment and we’ll do our best to help you out. We also have more Galaxy S9 tips that can enhance your experience of using the phone, so check those out as well. The post Did you enable the floating camera button on your Galaxy S9? appeared first on SamMobile. Samsung was hit by a major corruption scandal last year that had far-reaching repercussions both inside and outside the company. The scandal brought down South Korea’s former president Park Geun-hye and landed Samsung Electronics Vice Chairman Lee Jae-yong in jail on charges of bribery and corruption. A Seoul court found Lee guilty and sentenced him to five years in prison. He filed an appeal with the Seoul High Court and walked out as a free man in February this year after the presiding judge observed Lee’s role in the scandal as “passive compliance to political power” and suspended his jail sentence. Post his release from the jail, Lee has been keeping a low profile and even skipped the annual shareholders’ meeting in Seoul last week. According to a report in the Yonhap News, Lee is expected to resume his duties at Samsung next month. He left the country on March 22 for a business trip and is expected to return home in April. The report quotes an industry insider saying, “Lee is currently in Europe and may visit North America before returning home. He may also visit some Asian countries, but all schedules are flexible.” He is reportedly meeting key officials from global IT firms to discuss and share ideas on new growth opportunities. After returning home, Lee will work from both Seoul and Suwon offices according to the sources. He will also reportedly refrain from making public appearances for some time and focus on his work by keeping a low profile. The post Samsung heir Lee Jae-yong will be back in office next month appeared first on SamMobile. The Galaxy S9 and Galaxy S9+ are Samsung’s latest top-end phones, and it’s no surprise that these devices come with new functionality that isn’t present on the company’s 2017 flagships. It’s also not surprising that Samsung is working on slowly bringing some of that functionality to older devices through updates, and one such Galaxy S9 feature is making its way to the Galaxy S8 and Galaxy Note 8 today. Samsung has released an update for Always On Display (AOD) that adds support for using GIF files on the Galaxy S8 and Galaxy Note 8. The post Always On Display update brings GIF support for the Galaxy S8 and Note 8 appeared first on SamMobile. The post Galaxy S9 can hit speeds of over 500Mbps on AT&T’s LTE network appeared first on SamMobile. Samsung has released the March 2018 security patch for a handful of devices over the past few days including but not limited to the Galaxy Note 8, Galaxy S7 and the Galaxy A7. It has now released the security patch for the month of March 2018 for the Galaxy S7 edge, the Galaxy C7 Pro and the Galaxy A8+ (2018). Samsung started rolling out the latest security maintenance release for the Galaxy S7 earlier this week. It was only a matter of time before the Galaxy S7 edge got it as well. The company is now rolling out firmware version G935FXXS2DRC3 for the Galaxy S7 edge in several markets across Europe. The firmware file is now available for download from our database. The Galaxy C7 Pro is finally getting a more recent security patch. Samsung has released firmware version C701FDDU1BRC2 for the Galaxy C7 Pro in India today, bringing it up from the August 2017 security patch. The update is now being rolled out for users over-the-air in India and it can also be downloaded from our firmware section. 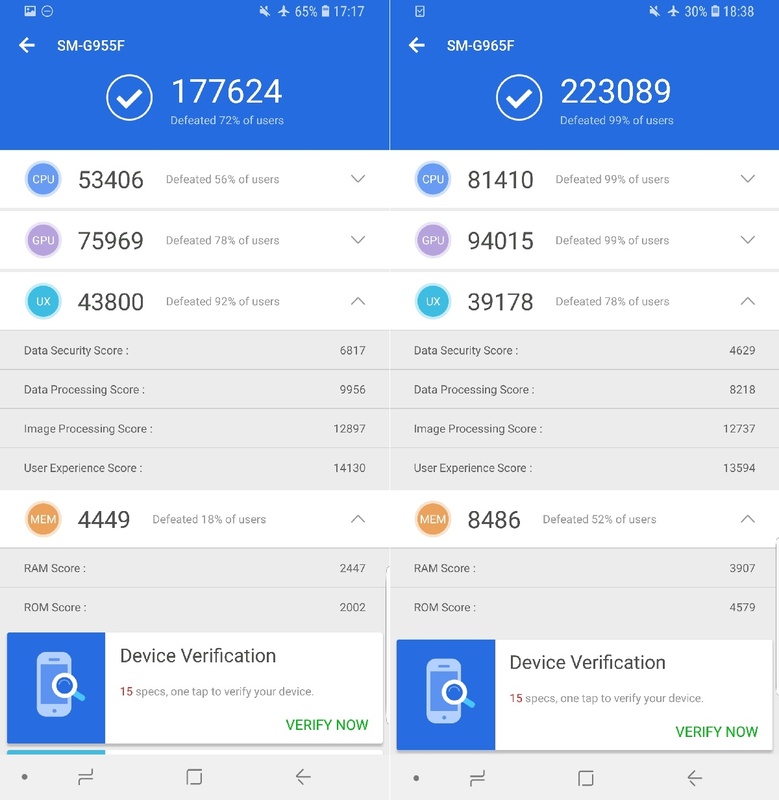 The Galaxy A8 (2018) was the first device to receive the March security update after Samsung detailed it earlier this month. The company has promised to release monthly security updates for this device but for some odd reason has decided to put the Galaxy A8+ (2018) on a quarterly update schedule. 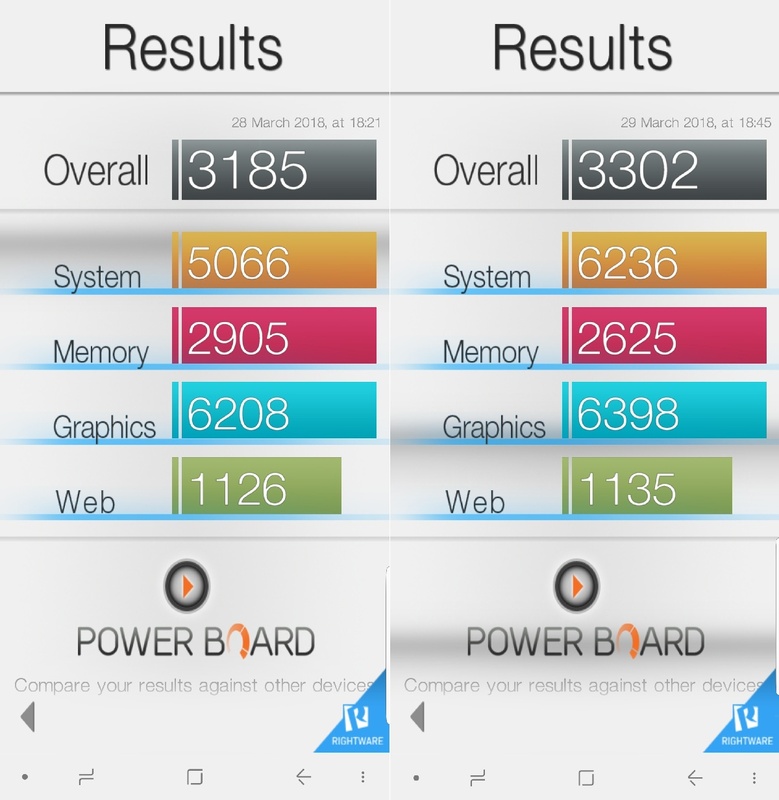 The Galaxy A8+ (2018) is now receiving firmware version A730FXXU2ARC9 in markets like Russia and Uzbekistan. Given Samsung’s decision to put the device on a quarterly update schedule, it looks like users will have to stick with this patch for a few months. The firmware file can also be downloaded from our database. The security patch for the month of March 2018 brings fixes for nine critical vulnerabilities in the Android operating system. It also patches dozens of moderate-risk and high-risk vulnerabilities. Fixes for five Samsung Vulnerabilities and Exposures (SVE) items in the company’s own software are included as well. The post Galaxy S7 edge, Galaxy C7 Pro and Galaxy A8+ (2018) get March security patch appeared first on SamMobile. The Galaxy Note 8 Android Oreo update is now being rolled out by Verizon and Sprint in the United States some three days after AT&T became the first carrier in the country to release the update for this device. Interestingly, AT&T was the last carrier to release the Galaxy S8 Android Oreo update in the United States. Countless Galaxy Note 8 owners on both carriers have now confirmed that they’re now receiving the latest firmware update for their device. It was expected that both of these carriers would release the update soon because Samsung had promised on its official US support forums last week that it’s going to release the Galaxy Note 8 Android Oreo update for all variants of the device within 2-3 weeks. It promised that the update is going to be released within this timeframe for both carrier-locked and unlocked variants. The unlocked Galaxy Note 8 might get its Oreo update in the US a bit later than the carrier-locked counterparts. That’s because Samsung needs to run additional tests on unlocked models to ensure that they function properly on all networks that they’re compatible with. Even though all four major carriers have released Oreo for the Galaxy S8 and the Galaxy S8+, the unlocked models have yet to receive the update for this very reason. Firmware version N950USQU3CRC2 is now being rolled out for the Galaxy Note 8 over-the-air. It bumps up the core Android OS version to 8.0 and brings all of the features that are part and parcel of Android Oreo. These include picture-in-picture mode, Autofill, notification dots and more. You can find out more about the new features in Oreo by checking out our extensive What’s New With Android 8.0 Oreo series. Verizon has finally cleared the way for the Device Maintenance app on the Galaxy Note 8. The app lets users perform minor optimizations on the device such as freeing up storage and memory. It also lets them tweak device security settings. The app was initially disabled but it’s now available on Verizon’s Galaxy Note 8 with the Oreo update. Verizon and Sprint users should expect to receive a notification for the Galaxy Note 8 Android Oreo update soon if they haven’t already. The update can also be manually pulled by launching the Settings app and navigating to the Software update menu. T-Mobile is now the only major U.S. carrier left that’s yet to release the Galaxy Note 8 Android Oreo update. The post Verizon and Sprint release Galaxy Note 8 Android Oreo update appeared first on SamMobile. LG asks Reddit for feedback on "the Notch"
Recently, we reported about the devices that could launch as the Galaxy J8 and Galaxy J8+. 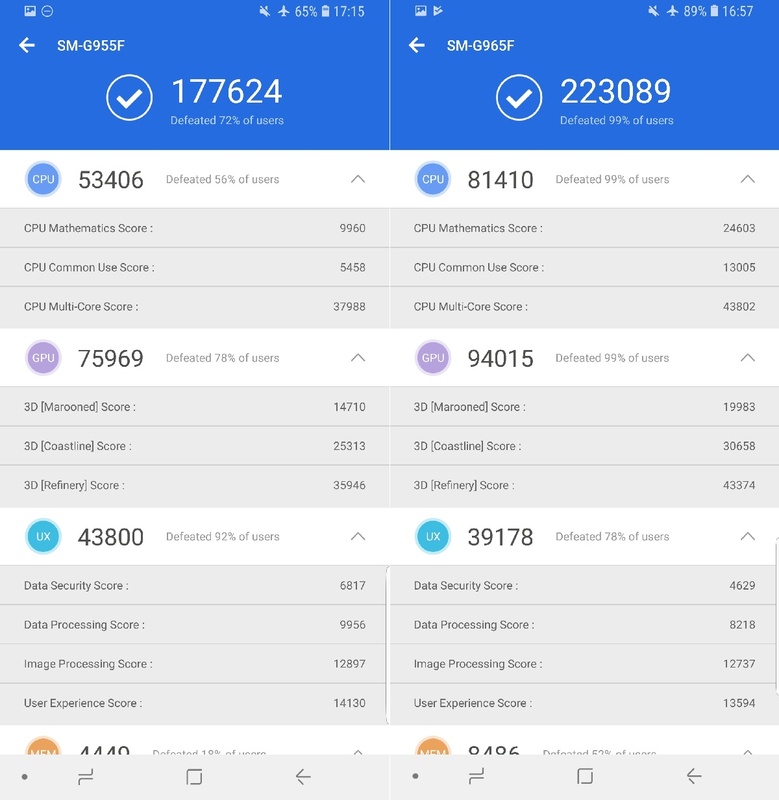 The SM-J800FN model that could be the Galaxy J8 has been spotted on a benchmarking website and at the Wi-Fi Alliance recently. 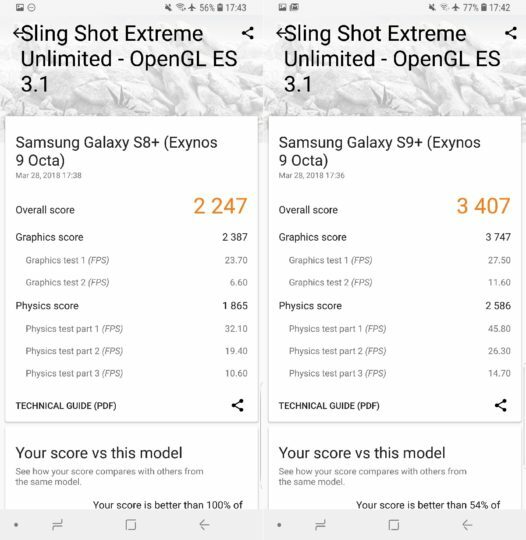 The SM-J805G model which points to a Galaxy J8+, based on Samsung’s naming pattern, also surfaced on a benchmarking website earlier this month. 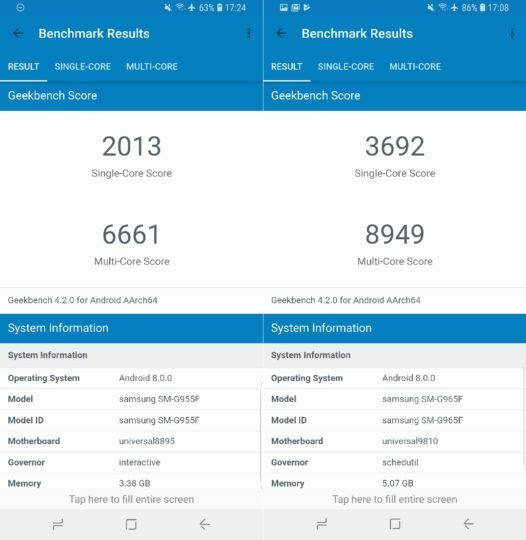 According to the information revealed in the benchmarks, the Galaxy J8 is expected to come with an Exynos 7870 processor, 3GB of RAM, and Android 8.0 Oreo on board. 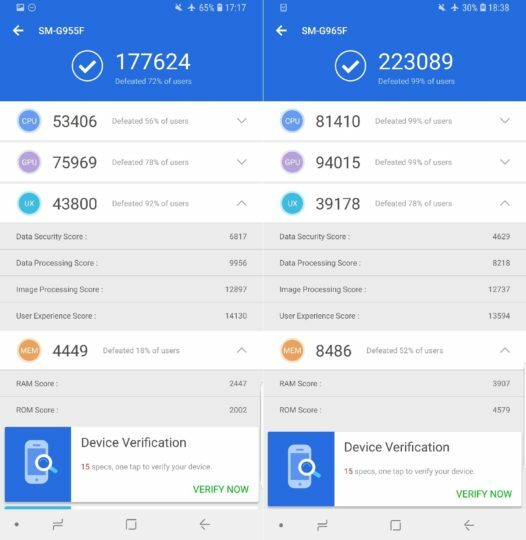 The Galaxy J8+ benchmark reveals an Android 8.0 device that’s powered by a Snapdragon 625 SoC and 4GB of RAM. Thanks to Brazilian telecommunications regulator Anatel we now know the expected battery capacity of the two devices as well. According to the battery photos on the agency’s website, the Galaxy J8 and J8+ are expected to pack 3,000 mAh and 3,500 mAh batteries respectively. 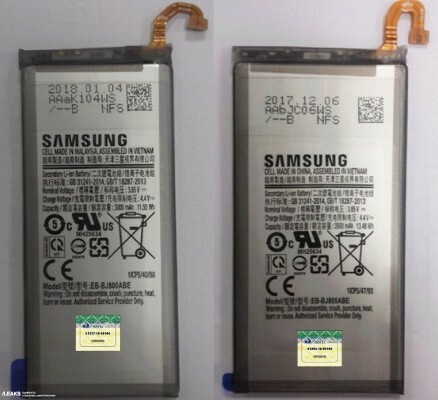 The Galaxy S9 and S9+ batteries were also revealed before their launch by the same Brazilian agency, and they turned out to be true. Reports online suggest that Samsung will be launching the Galaxy J8 and J8+ with flat screen Infinity Displays, mimicking the Galaxy A8 (2018) and A8+ (2018) launched earlier this year. It is seen as a strategy by Samsung to offer phones with Infinity Displays at different price segments to cover all the bases. Although the J8 and J8+ are closely related, they haven’t been spotted together so far. This is the first time information about the two devices has appeared together, and they indeed seem to be following in the footsteps of the Galaxy A8 and A8+. The post Galaxy J8 and J8+ battery capacity possibly revealed appeared first on SamMobile. Benchmark comparisons aren’t something we usually do. In fact, we never bother with benchmarks, because most benchmarks simulate extreme use cases that don’t reflect how the everyday experience of using a device would be. 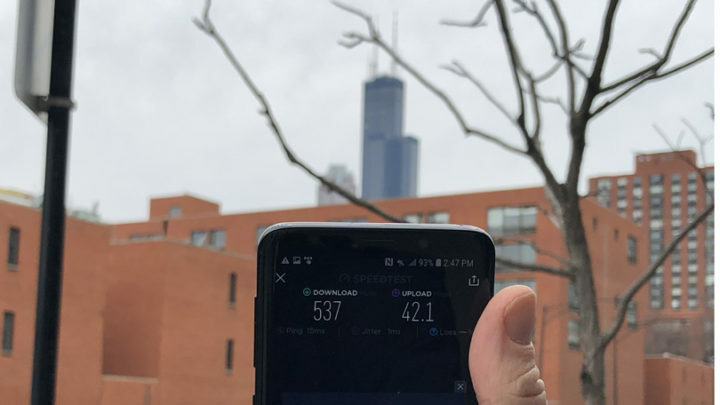 And, well, if a phone’s software isn’t properly optimized, lag and stutter in regular operation make even the highest benchmark scores seem useless. Samsung’s phones are certainly guilty of dipping in performance even a month down the line, and the company’s flagship Galaxy S devices are affected as well. It’s not like the company can’t optimize things well enough, though. The post-Galaxy S6 Note series phones usually perform admirably months after you start using them, but the same level of optimization is yet to permeate the rest of Samsung’s smartphone lineup. 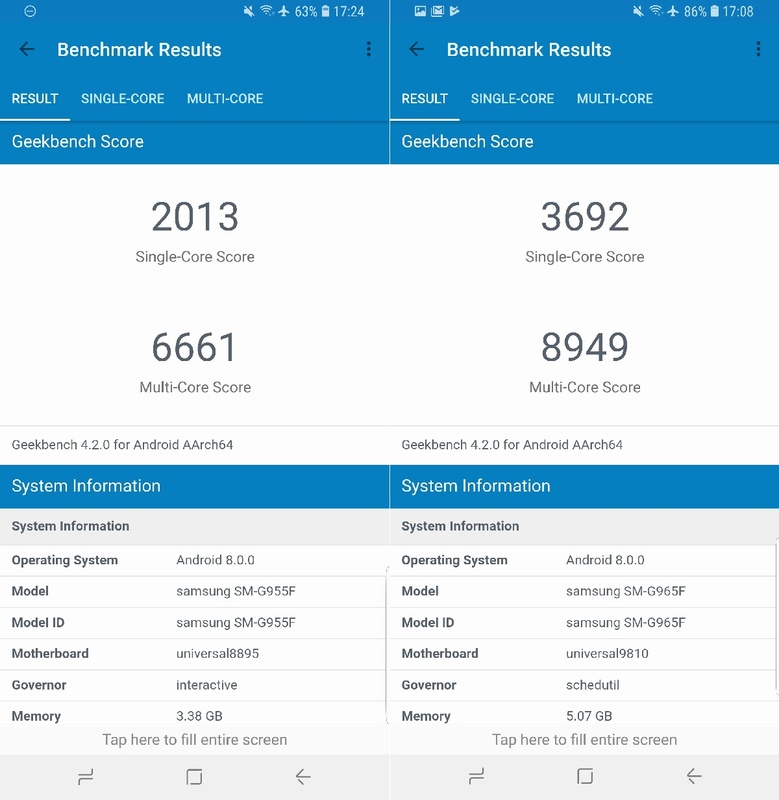 Where benchmarks matter is showing us just what kind of performance a new device is technically capable of compared to the one that came before, and it holds especially true for flagship phones, which come with a newer, more powerful/efficient processor every year. 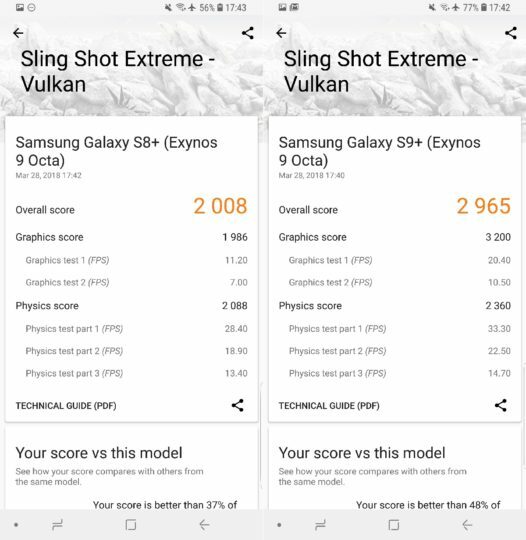 The Galaxy S9, for example, is powered by the Exynos 9810, while the Galaxy S8 (and Note 8) was powered by the Exynos 8895. 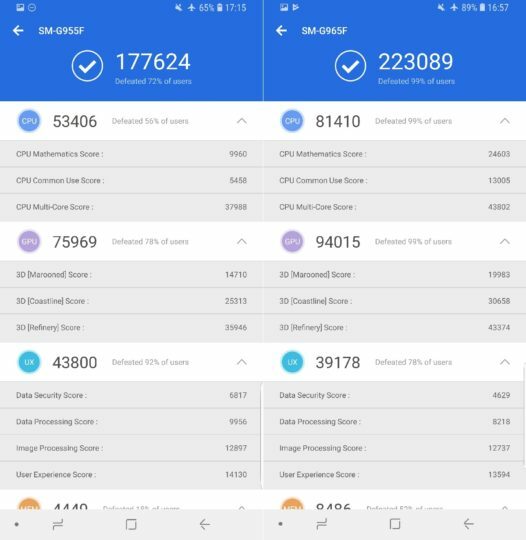 The Exynos 9810 might be built on a 10 nm process like the Exynos 8895, but it does get new microprocessor cores and a more powerful GPU. Even the 10 nm process used for the 9810 is more refined and makes for better theoretical power efficiency and performance over chips built on the first-generation 10 nm process. On the Galaxy S9+, you also get 6GB of RAM, while the Galaxy S8 and S8+ had to make do with 4GB of RAM, so the real-world user experience on the S9+ is noticeably better than the S8+. But where do these devices stand when it comes to benchmark performance? 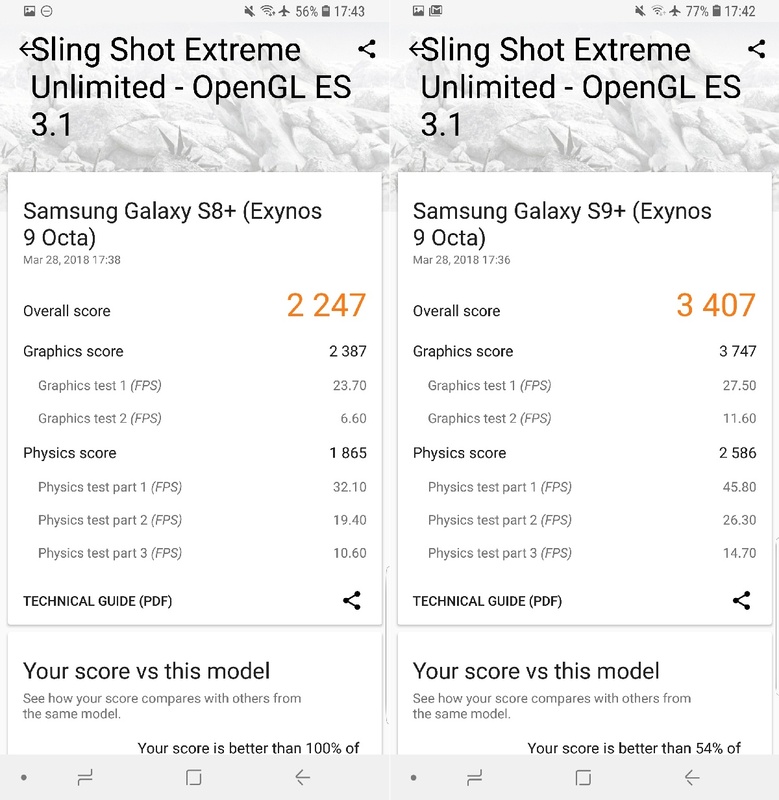 We decided to run a few popular benchmarks on the Galaxy S8+ and Galaxy S9+ to find out, and, unsurprisingly, the Galaxy S9+ came out on top in nearly all tests. We have even thrown in an internet speed test comparison over Wi-Fi for good measure (although these can vary wildly depending on the router the devices connect to and shouldn’t be taken too seriously). We’ll just let the scores do the talking, however, so check those out by looking at the images below and let us know your thoughts in the comments. 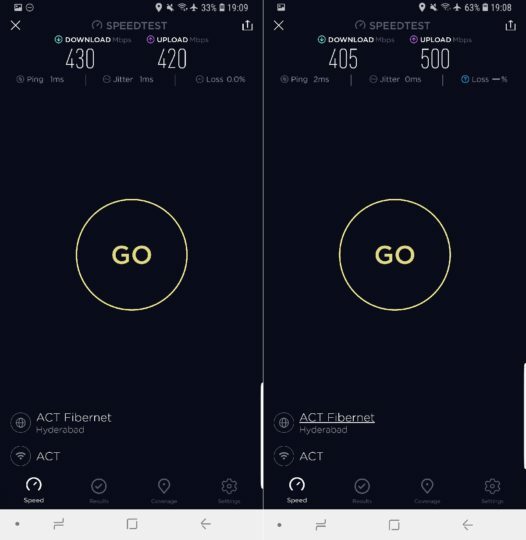 The Galaxy S8+ scores are on the left, and the S9+ scores are on the right in each picture. 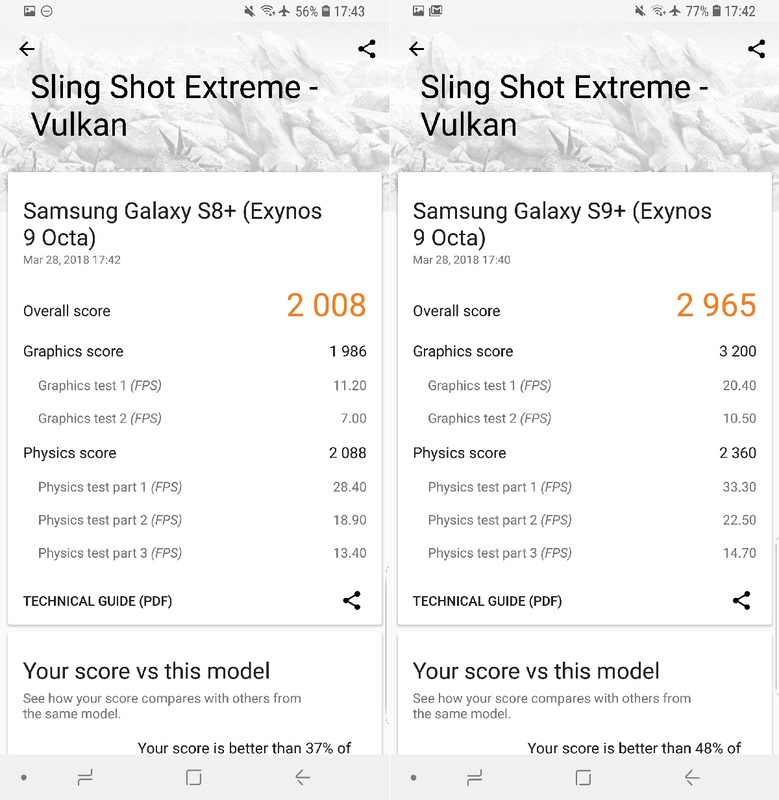 Unfortunately, we were unable to test the regular Galaxy S9 against a Galaxy S8, but since the S9 only gets less RAM, its benchmark scores should be similar to the S9+ on most accounts. 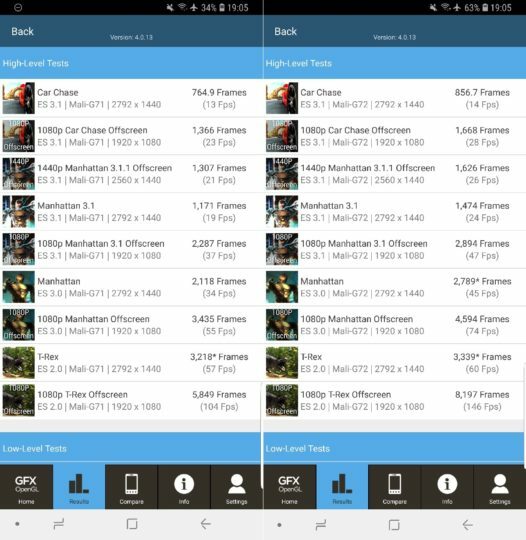 The post Benchmark performance comparison: Galaxy S8+ vs Galaxy S9+ appeared first on SamMobile. All these years, many smartphones sold in the US had their FM chip disabled intentionally by the carriers and OEMs for commercial reasons. It was seen as a move by the carriers to push users to consume more data and thereby pay more every month. Thankfully, things started changing in the last year or so when LG, Motorola, Alcatel, and other companies decided to activate the FM chips on their smartphones going forward. Earlier this year, Samsung also joined the party by deciding to activate the FM chips on its upcoming smartphones in the US and Canada. While Samsung kept its promise for the carrier variants of the recently launched Galaxy S9 and Galaxy S9+ sold in the US, it appears the unlocked Galaxy S9 and S9+ models don’t have their FM chips activated yet. NextRadio, the company that Samsung partnered with to enable the FM chips on its smartphones, lists only the carrier variants of the Galaxy S9 and S9+ as supported models. “Samsung mistakenly did not add the NAB FM API to the unlocked devices. Our team confirmed this with them a couple of days after release upon receiving reports the app did not work. Samsung has said it will be in the first update they do, but have not yet settled on a date. Many people buy unlocked Galaxy smartphones in the US to avoid all the anti-customer decisions associated with the carrier variants. So, it must be disappointing for the unlocked Galaxy S9 and S9+ users in the US to miss out on a nifty little feature. Hopefully, Samsung pushes the promised update soon and fix this. The post Unlocked Galaxy S9 and S9+ in the US will get FM radio support in the next update appeared first on SamMobile. Being the latest flagship in Samsung’s galaxy of smartphones, the Galaxy S9 is unsurprisingly getting all the attention when it comes to software updates. The first update to the Galaxy S9 and S9+ came just a few days before these handsets went up for sale in numerous markets around the world, and earlier this week, Samsung released another update for the S9 and S9+. This update was only available in Germany initially, but the Korean giant isn’t wasting any time and has now made the update available in other markets as well. The latest Galaxy S9 update, with build number XXU1ARCC, brings improvements to call stability and wallpaper quality. The changelog isn’t just for show, as we did run into call stability issues on one of our Galaxy S9+ units recently. Considering everything was fine when we used the Galaxy S9 on pre-final software for our review, it seems the problem may have been introduced by the first update. Or, well, it was just our network operator to blame, but it’s good to see Samsung actively fixing issues on the Galaxy S9 and S9+. 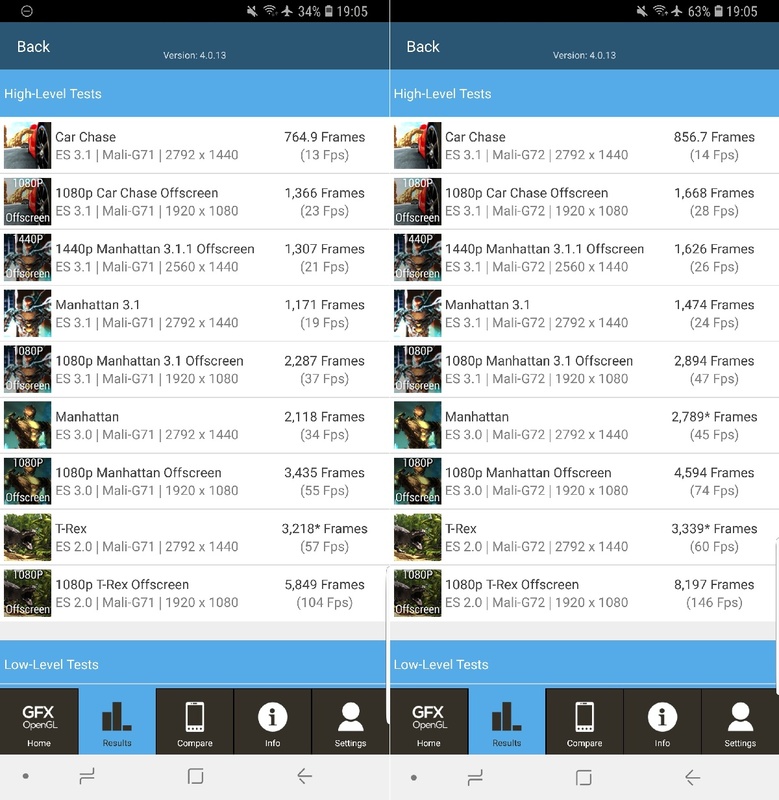 As for wallpaper quality, we tried comparing two Galaxy S9s, one running the newest firmware and another that we haven’t still updated, and there seems to be no difference in quality with either stock of third-party wallpapers. To grab the new update on your Galaxy S9 or S9+, go into the phone’s settings, tap Software update, followed by the Download updates manually option. The size of the update seems to vary from country to country, but you can expect it to be somewhere between 250 MB and 350 MB if you download it over the air, so make sure you’re on a Wi-Fi connection or have enough bandwidth if you decide to update using mobile data. We also have the full firmware files in our firmware database, although it may take some time for your country’s firmware to show up. The post New Galaxy S9 update rolling out in more markets appeared first on SamMobile. It’s here, the first early Galaxy Note 9 release report. Whenever a new Samsung flagship in the pipeline we tend to hear reports that Samsung is going to release the handset earlier than its predecessor. There were similar reports for the Galaxy S9 which turned out to be true as the Galaxy S9 was announced on February 25, 2018 and released on March 16. The Galaxy S8 was announced on March 29, 2017 and released on April 21. So it’s not surprising to see a report out of South Korea claim that the Galaxy Note 9 release is likely going to take place earlier than expected. It blames less-than-steller performance of the Galaxy S9 for that. According to the report, the Galaxy Note 9 is going to be released earlier than the Galaxy Note 8 to make up for the less-than-stellar sales of the Galaxy S9. Samsung apparently wants to outshine Apple’s new iPhones as well which is why it may consider an early release. Apple’s new iPhones aren’t expected until September this year. Samsung hasn’t revealed the sales figures for its new flagship just yet but it expects Galaxy S9 sales to outperform the Galaxy S8. However, a recent report claimed that the Galaxy S9 is proving to be a tough sell in South Korea as customers aren’t too enthusiastic about the handset. We also reported recently that 36 percent of Galaxy S8 owners don’t feel the need to upgrade to the Galaxy S9. There could be some truth to reports that the Galaxy S9 sales are not up to the company’s expectations. Just in case you forgot, the Galaxy Note 8 was announced on August 23, 2017 and Samsung started taking pre-orders in key markets the very next day. It released the Galaxy Note 8 on September 15. This report about an early Galaxy Note 9 release is based on predictions that Samsung Display is going to start producing the 6.38-inch OLED panel for the Galaxy Note 9 next month, two months before it normally does that for an upcoming flagship phablet. It is thus claimed that the next Note flagship could be released “as early as July or August.” Samsung Display declined to comment on the production schedule. We did report last week that Samsung has started firmware development for the Galaxy Note 9 two weeks earlier than it did for the Galaxy Note 8 last year. It also started firmware development for the Galaxy S9 a fortnight before it did for the Galaxy S8. While that’s enough to form an assumption that the Galaxy Note 9 release could take place earlier than expected, it’s far from confirmed at this point in time. Take this information with a grain of salt for now as we’ll likely see conflicting reports about the Galaxy Note 9 release in the months to come. The post Early Galaxy Note 9 release report blames the Galaxy S9 appeared first on SamMobile.